Mauricio Pochettino hailed a fantastic second-half performance from Tottenham as they took a huge step towards the Champions League quarter-finals with a 3-0 win over Borussia Dortmund. Spurs had lacked quality in the opening 45 minutes at Wembley but Pochettino worked his magic at the break to inspire more second-half goals for his side. Tottenham have scored 11 goals after half-time in the Champions League this season, with Son Heung-min, Jan Vertonghen and Fernando Llorente grabbing the latest three on Wednesday. Pochettino was pleased with the response he got from his squad, but warned they cannot afford to think about the last eight just yet. 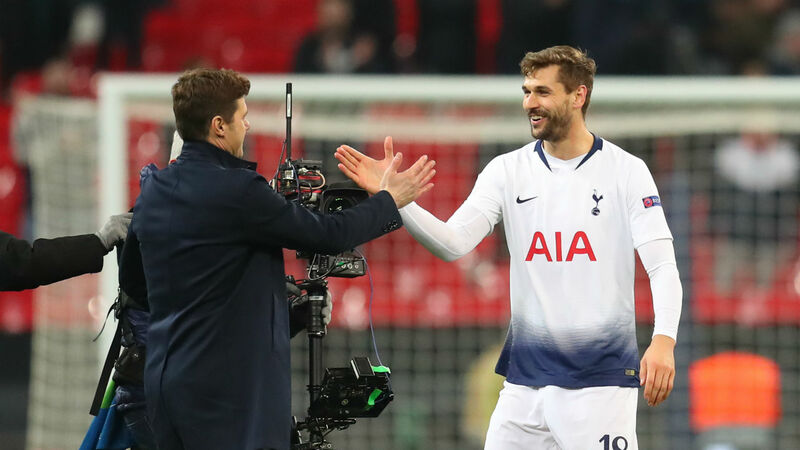 "It was a fantastic second half," the Spurs boss told BT Sport. "The first half was difficult, it was a difficult game from the beginning, difficult for us to find our best positions in both directions, with and without the ball. "We struggled to play the way we wanted to. "At half-time we fixed some situations and once we scored we began to play with confidence. It was a fantastic game. But there is still work to do. Spurs' night kicked into gear thanks to Son's fourth goal in as many games in all competitions, but he too was keen to stress they still have plenty of work to do if they are going to progress. "It's not finished, we have to focus on the second game too," the forward said. "Harry [Kane] or Dele [Alli] are very important for us but we have players who can come in and do well. "We showed that, Fernando came on too and scored an important goal." Fellow goalscorer Vertonghen added: "Dortmund looked very strong and had the better of the game but in the second half we were able to turn it around. "They dropped off a bit then that early goal in the second half helped us. They were happy at 1-0, so we had the confidence to keep going and get the second and third."